When Artur Mas (pictured above) called early elections in late September, there was every reason to believe he would improve the position of his autonomist, center-right party, Convergència i Unió (CiU, Convergence and Union), in the wake of protests in Barcelona and throughout Catalunya (specifically on Sept. 11, a nationalist holiday in Catalunya) in favor of greater independence from Spain’s beleaguered federal government. Even as recently as a month ago, it seemed that CiU was poised to gain enough seats to take an absolute majority in the 135-member Catalan parliament (the Parlament de Catalunya). Instead, Mas’s party lost 12 seats and will fall to just 50 seats in the Catalan parliament. The CiU has long been Catalunya’s dominant party, and it controlled Catalunya’s regional parliament from 1980 until 2003 — it has won the largest share of seats in every regional election since Spain’s return to democracy, and that was always unlikely to change after Sunday’s election. Moreover, the result leaves the CiU in a stronger position than after the 2003 and 2006 elections, when a resurgent federalist, center-left Partit dels Socialistes de Catalunya (PSC, Socialists’ Party of Catalunya) won enough seats to lead governing coalitions in the regional government. All the same, Mas’s gambit — hopping on the bandwagon of wide Catalan discontent by wrapping himself in the cause of Catalan independence — has clearly backfired, and Mas will have fallen back from a near-absolute majority status two years sooner than necessary. The CiU won just 30.68% of the vote on Sunday, a drop of 7.75% from the 2010 election that returned the CiU to power. Meanwhile, the PSC won 14.43% and just 20 seats — eight fewer than its historically poor result in 2010. 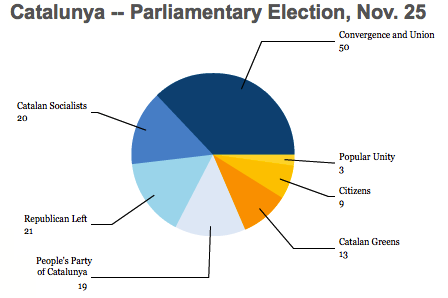 The ‘winner’ of the election in relative terms is clearly the Esquerra Republicana de Catalunya (ERC, Republican Left of Catalunya) — a leftist party in favor of Catalan independence, which won 13.68% and 21 seats, giving it the second-largest number of seats in the parliament (although just barely). The CiU will most likely seek a governing coalition with the ERC for a broad separatist coalition. Although the ERC joined in a governing coalition with the PSC from 2003 to 2010, its current leader since 2011, Oriol Junqueras, has moderated the ERC’s sometimes-radical leftist tone, while pulling the ERC toward a more pro-independence line. Both moves make it a likelier coalition partner for the CiU, and Junqueras looks set to become the second-most important politician in Catalunya after Mas. The ERC has indicated, however, that it will seek some moderation of the CiU’s support for austerity policies in exchange for joining any coalition. If negotiations fail with the ERC, however, the CiU might also seek a coalition with the PSC or other parties. 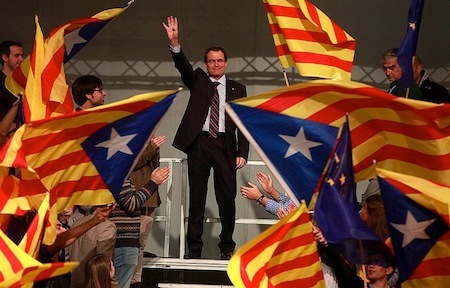 The Partit Popular de Catalunya (PPC, People’s Party of Catalunya) — the local variant of Spanish prime minister Mariano Rajoy’s Partido Popular (the PP, or the People’s Party) won 12.99% and gained one seat for a total of 19. The Iniciativa per Catalunya Verds – Esquerra Unida i Alternativa (ICV-EUiA), a green/leftist coalition, won 9.89% and 13 seats, while Ciutadans – Partit de la Ciutadania (C’s, Citizens — Party of the Citizenry), a center-left, federalist and euroskeptic Catalan party, won 7.58% and nine seats. A group of radical leftists, the Candidatures d’Unitat Popular (CUP — Popular Unity Candidates), broke through for the first time at the regional level with 3.48% and three seats. On the axis of ‘federalist’ parties (PSC, PPC and Ciutadans) versus autonomist and pro-independence parties (everyone else), the ‘federalists’ won 48 seats to 87 seats for the ‘separatists.’ If you break down the 2010 result, this is a one-seat ‘gain’ for ‘separatists.’ So the Catalan parliament will actually remain remarkably stable in terms of the balance of power on the separatist axis. But the real story of the election comes when you look at the axis of parties that are ‘tainted’ with having supported austerity policies — that includes not just the PPC and CiU, but also the PSC, which controlled Catalunya’s fiscal policy through 2010 and is the local arm of the national center-left Partido Socialista Obrero Español (PSOE, Spanish Socialist Workers’ Party) that governed Spain until December 2011 and implemented the first of Spain’s federal austerity policies. Those three parties’ share of the Catalan parliament’s seats dropped from 108 to 89 on Sunday, while the other parties — all of which are anti-austerity and/or protest parties of some degree — surged from 27 seats to 46 seats. Taken together, the result indicates that Catalans haven’t necessarily reached a point of historically high support for independence as much as they, like most electorates throughout Europe in the past three years, remain weary of recession and unemployment, coupled simultaneously with budget cuts and tax increases. At the end of the day, when you get past all of the sturm und drang about Catalan independence leading up to the election, the Catalan result fits fairly neatly within the context of the wider eurozone debate (which Edward Hugh noted back in October). I’ll have some further thoughts later today or tomorrow in a separate post on what the result means for ‘Catalan independence’ as such. In the meanwhile, Mas, who has led the CiU since 2004, will likely remain leader of the CiU, but it’s certain that there will be less convergence and union within the CiU going forward. The CiU is actually a merger of two parties — Convergència Democràtica de Catalunya (CDC, Democratic Convergence of Catalunya) and Unió Democràtica de Catalunya (UDC, Democratic Union of Catalunya). Traditionally, the CDC has been more socially liberal, while the UDC has been more socially conservative — the UDC comes from a more Christian democratic pedigree, while the CDC comes from a more social democratic tradition. Likewise, although CiU has obviously been pro-independence in the 2012 elections, it’s traditionally been cagier about its position vis-a-vis Catalan separatism and, again, the CDC has been more aggressively sovereigntist with the UDC historically taking a softer autonomist stance. Mas comes from the ‘Convergence’ side of the CiU, but the UDC’s leader Josep Antoni Duran Lleida will certainly take on a larger profile in the months ahead. Furthermore, the CDC’s general secretary Oriol Pujol, the son of Jordi Pujol, Catalunya’s former regional president from 1980 to 2003, is waiting in the wings to reassert the Pujol family’s control over the CDC, the CiU and Cataluyna. Both Duran Lleida and Pujol supported Mas’s move for early elections, and they seem unlikely to challenge his leadership anytime soon, but that could quickly change before the next scheduled elections in 2016, especially if Mas is unable to form a governing coalition or if Mas loses any referendum on independence in the future.